O Holy Spirit, Divine Paaclete, Father of the poor, Consoler of the afflicted, and Sanctifier of souls, behold us prostrate in Your presence. We adore You with deepest submission and we reqeat with the Seraphim who stand before Your throne; "Holy, holy, holy!" You filled the soul of Mary with immense graces and inflamed the hearts of the Apostles with holy zeal; enkindle our hearts with Your love. You are a supernatural light; enlighten us that we may understand eternal things. You appeared as a dove; grant us purity of like. You came as a wind full of sweetness; disperse the storms of passion that rise in us. You appeared as a tongue; teach us to sing Your praises without ceasing. You came forth in a cloud; cover us with the shade of Your protection. O Bestower of heavenly gifts, vivify us by Your grace, sanctify us by Your love, and govern us by Your infinite mercy, so that we may never cease blessing , praising, and loving You now during our earthly lives and later in heaven for all eternity. Amen. The Descent in a 15th century illuminated manuscript Musee Conde, Chantilly. 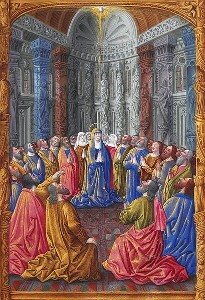 The Holy Spirit is depicted as a dove in the topmost area of painting.